This block of four dwellings is the sequel to that of 1931. Originally Gerrit Rietveld and Truus Schröder wanted a four-storey block of flats but the local council was against it. This block has three storeys: the middle storey is shared by the dwellings on the other two. The downstairs units have their bedrooms at the rear and those upstairs at the front. Spatially both housing blocks, just round the corner from the Schröder house, are in keeping with the principles of De Stijl, but were more specifically intended as prototypes of good, functional housing. 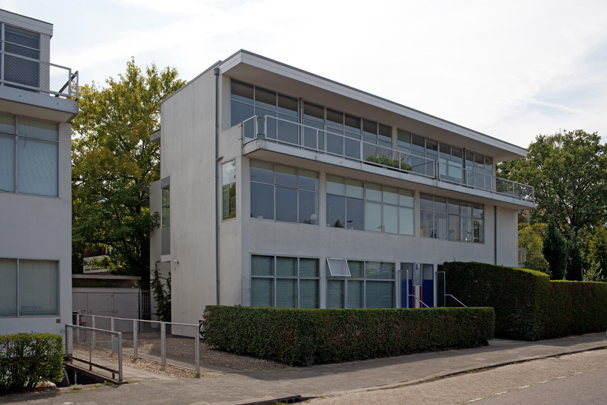 Truus Schröder, who financed the project, hoped it would mark Rietveld's entry into the mass housing market. However, Rietveld remains best known as a designer of free-standing residences for the cultural elite. Truus Schröder lived in one of the apartments for a while when her house was temporarily in use as a nursery school.